American Western Cigar Co. nationally launched the El Rey® MYO tubes and accessories in 2003 to much anticipation of this growing market. We are proud to have maintained our pricing at the original market introduction levels. That's almost 3 years with no price increase for this very cost-conscious line! 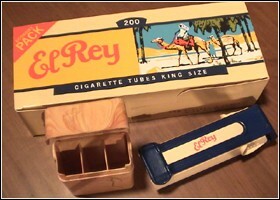 The El Rey Filter Tubes are available in Regular, Light, and Menthol King Size. Packaged in cartons per case of 50 units for all flavors with an additional 100 carton count for Menthol. The El Rey Tubes are universally sized to work exceptionally well with all injector machines.